Welcome to our March Stamper's Dozen Blog Hop - this month we are focusing on food! I used the Tasty Trucks stamp set to create my card. I thought it would be fun to use the truck and create a taco food truck! 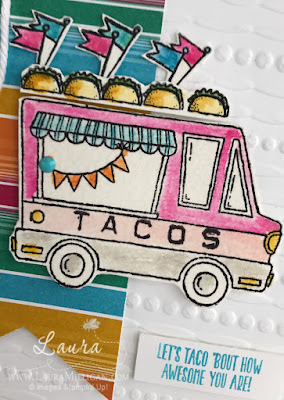 I stamped the truck, a row of tacos, and the banners on watercolor paper and after watercoloring them, cut them out. I used the Festive embossing folder, and embossed a piece of Whisper White cardstock. The banner was created with a piece of the Festive Birthday Designer Series Paper - and pulled my colors for my card from this color palate. The word TACOS along the side of the truck was stamped with the Labeler Alphabet stamp set. Now I wasn't going to share this, but I guess I will! LOL!!! 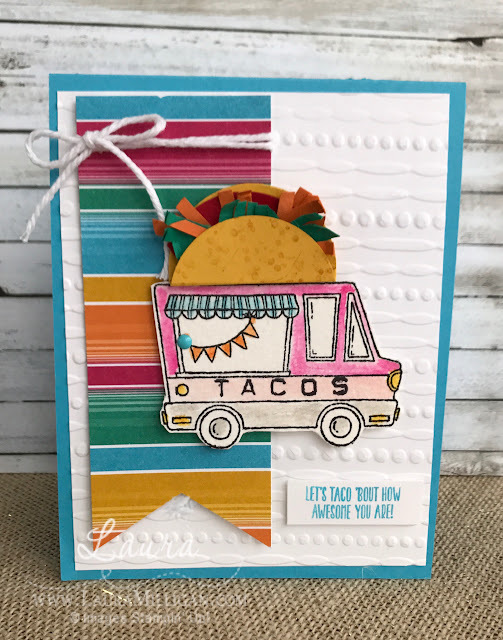 This was my first attempt at this card - I created a Taco Food Truck - but this one has a giant taco on top! It is kind of a "Blooper", but oh well - here it is!!! To create the taco, I used a 1 3/4 inch circle punch - and folded it so the back was a little taller than the front. I added a red circle for the tomatoes, and some shreds of paper to create the shredded lettuce and shredded cheddar cheese. 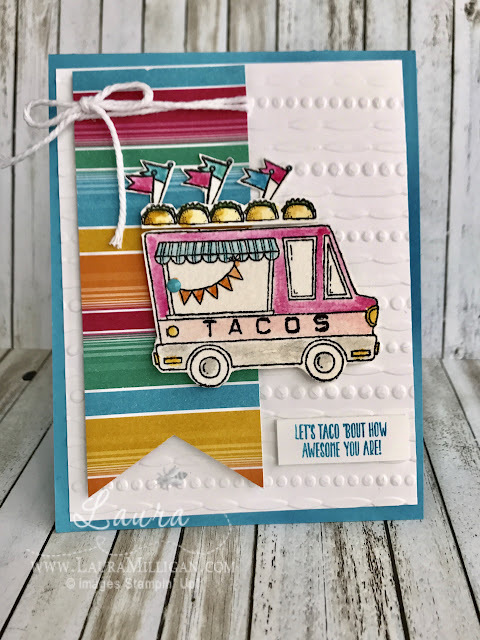 I used the Labeler Alphabet stamp to add "tacos" to the side of the truck - a great way to advertise what they are selling - as if the giant taco on top isn't enough!!! Which card do you prefer? Would love to hear from you! Be sure to scroll to the bottom of this post to read about an ordering special I am offering this month! Next on our hop is Judy Garza. Let's check out what she has created!